A terrorist car bomb and a suicide bomber right in the middle of Stockholm with the sole purpose of killing Christmas shoppers. 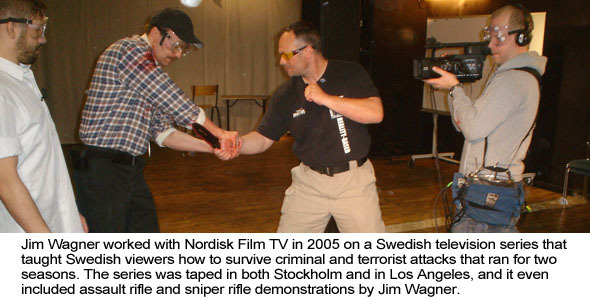 Many thought it could never happen in Sweden, but I have not only been warning Swedish citizens about a possible attack for the past five years, but I have been training people in both Stockholm and in Malm how to detect a possible terrorist attack about to occur, how to survive one if you happen to get caught right in the middle of it, and what to do after a terrorist attack. This is last phase is known as “post-conflict,” and many people flocked to see the “car accident” that had just taken place, not realizing that the terrorist had on a bomb belt and intended to blow up the on lookers who are ignorant about modern terrorism. Fortunately, not everything went off as planned. The terrorist made mistakes, and I also teach how to take advantage of those mistakes. Just wanted to inform you that we have just had a suicide bomber blow up a car in central Stockholm a few hours ago and then himself “in the exact manner you talked about during your training seminar in Bor’s where I attended. As an extreme stroke of good luck only the bomber himself was killed in the attack as only one of his six pipe bombs detonated and the car bomb was poorly constructed; like the Times Square car bomb. It could have been a massacre since Swedes have no inherent “terror-fear” or understanding of the situation that we now face. Onlookers flocked to the scene of the car bomb believing it to be a normal accident and the terrorist then proceeded to try and kill as many of these people as possible, but thankfully he failed. 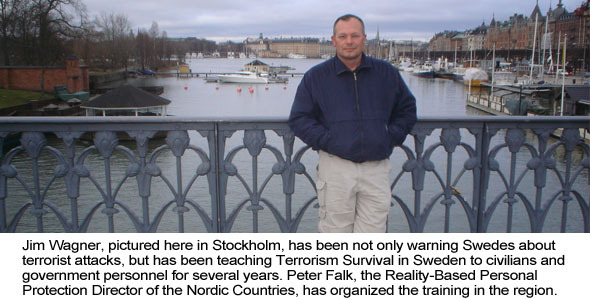 Online the terrorist claimed to have been to various Middle Eastern countries for training and that he was only a small part in a larger network of radical Muslims already in Sweden. I was present in Stockholm during the attack, and could actually hear one of the bombes going of, but I never could have guessed that it was a bomb. I was far away, and also being in Sweden a terrorist attack is not the first thing you think about. I later spoke to a policeman about the incident and could overhear some of his radio conversations with dispatch, and there was a real threat against common Swedes. The attack had been aimed against civilians. 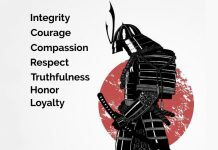 At that moment I realized just how glad I am to have had the privilege to attend your seminar and be part of the Reality Based Personal Protection training world. I think that had I been closer to the terrorist attack I would have had a greater chance of survival and also I would have had a much greater chance of saving others. 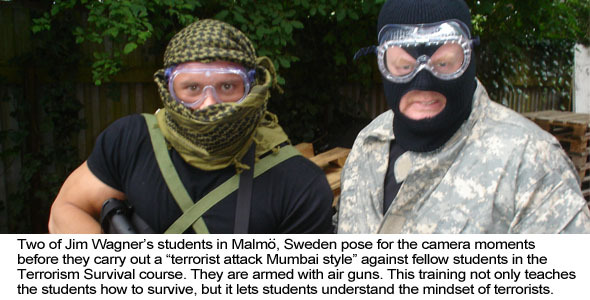 Many Swedish citizens thought that Islamic terrorism would never touch them, but here it is. It is now passed tense, and Sweden joins the ranks of the United States, Great Britain, France, Spain, Jordan, Saudi Arabia, Canada and every other country the Jihad has visited. Perhaps one day soon you will cross paths with a terrorist as he, or she in many cases, is making preparations for the next attack. Knowing the seven signs of terrorism may mean the difference between the terrorist being arrested and people dying – you. 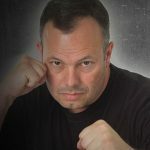 Situational awareness should be as much a part of your self-defense training as punching and kicking. 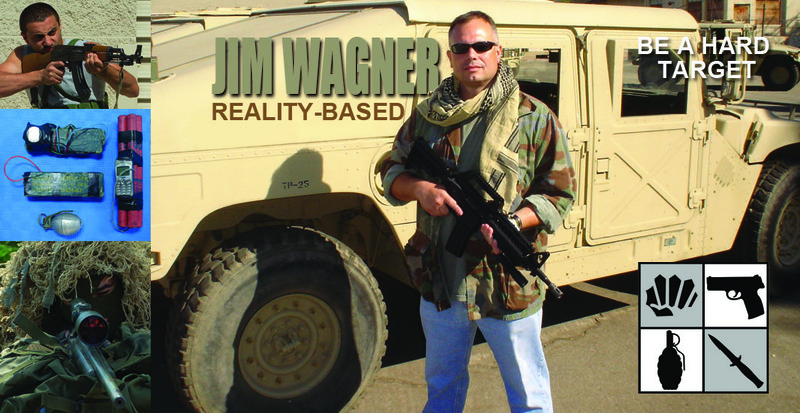 If you are a self-defense instructor in Sweden then the Jim Wagner Reality-Based Personal Protection Terrorism Survival course should be a part of your training curriculum. Surveillance – a terrorist, or terrorist cell, will select a target and determine the strengths of that target. They will visit the site and monitor activities at the location. This may include taking video, photographs, drawing diagrams or maps, taking notes, or using binoculars from a distance. Of course, the terrorist doing surveillance will try to blend in with his environment and make his activities appear normal. Several years ago four suspected terrorists believed to have ties with Al Qaeda were arrested in Spain. The Spanish authorities confiscated a video tape belonging to Ghasoub Al-Abrash Ghalyoun that had images of Disneyland, Universal Studios in Hollywood, and San Francisco’s Golden Gate Bridge in California; all of them crowded tourist spots. The tape, filmed in 1997, also showed the twin towers of the World Trade Center. Did somebody see one of these men in California video taping areas other than just the typical tourist stuff or acting a bit nervous and never reported it? We will never know, and we know what eventually happened to the World Trade Center in New York City on September 11, 2001. 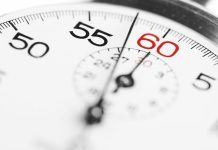 Testing Security – a terrorist may see “how far he can get.” For example, he may walk or drive into a secure area, try to get past physical barriers, or bypass access procedures until he is caught. This is a method to test the target’s strengths and weaknesses. Acquiring Supplies – a terrorist may not only attempt to purchase or steal law enforcement or military equipment, but it may be as inconspicuous as obtaining a uniform, purchasing a used ambulance, or buying an usual combination of materials at a hardware store. Suspicious People Who Don’t Belong – we don’t profile people, we profile behavior. Look for the unusual in the obvious. Ask yourself, “Is the person in the delivery uniform walking around with a box legitimate or an imposter?” Don’t automatically give legitimacy to someone you don’t know. Challenge the person in question and ask them some questions. Trial Runs – often times a terrorist will actually practice their plan without actually committing the terrorist act. They will walk through the target area and note any flaws in their plan or unanticipated problems. Usually the attack is within hours or days by the time it comes to this phase. Deploying Assets – the terrorist will get their assets close to the target. It can be as simple as a single gunman parking a car a couple blocks from the target area and moving in by foot, or be a well choreographed cell movement onto a school campus from different access points. If you see any suspicious activity, even if you don’t think it is much, you should report it immediately to your local police department. Don’t forget, you can also use the camera on your cell phone to take pictures of the suspicious person or activity. Images can be sent to the RTTAC. Of course, use extreme caution when gathering your own intelligence or you may end up being a target yourself.